US Army troops of the 1st Cavalry division's 2nd Battalion salute as the Stars and Stripes flag is lowered to half-mast, during a dawn ceremony in which the Iraqi flag was raised for the first time at a base in south eastern Baghdad on June 29, 2004. The battalion shares the base with Iraq's National Guard. The United States handed over sovereignty to an interim Iraqi government on Monday, two days before the schedule, in a surprising move probably aimed at thwarting any terrorist attempts. Sunsets are the most beautiful things! An event that occurs at the end of each day, an event that most of us hardly stop to look at. Each sunset seems to be different from the rest. Each appears to have its own mood/personality. Below are some pictures of sunsets. You'll see what I mean. "Water, water everywhere, but not a drop to drink..!" Eleven year old boy, Neel Saikai, 11 fills a bucket from a submerged tube well at Hajo, some 35 kms east of Guwahati, on June 25, 2004. Four more people have drowned in rising waters across the country, bringing to 21 the death toll from floods which began this week and which have already displaced 220,000 people from 200 submerged villages in Assam. This file image obtained June 24, 2004, courtesy of NASA, shows the Apollo 11 Saturn V space vehicle lifting off with Astronauts Neil A Armstrong, Michael Collins and Edwin E. Aldrin Jr. July 16, 1969, from Kennedy Space Center's Launch Complex 39A in Florida. This July 16, 2004 marks the 35th anniversary of the historic mission putting the first men on the lunar surface and returning safely to Earth. Astronaut Edwin E. Aldrin, Jr., lunar module pilot of the first lunar landing mission, poses for a photograph beside the deployed United States flag on the lunar surface area called the Sea of Tranquility in this July 20, 1969, file photo. This July 16, 2004, NASA celebrates the 35th anniversary of the start of the historic mission of Apollo 11. This May 1969 file photo shows the astronaut crew of the Apollo 11 lunar landing mission. Left to right, are Neil A. Armstrong, commander; Michael Collins, command module pilot; and Edwin E. Aldrin Jr., lunar module. This July 16, 2004, NASA celebrates the 35th anniversary of the historic launch and landing on the Moon of Apollo 11. This picture taken on July 20, 1969, of astronaut Edwin E. Aldrin Jr. walking on the surface of the moon near the leg of the Lunar Module ‘Eagle’ and astronaut Neil Armstrong, during the Apollo 11 extravehicular activity (EVA). This July 16, 2004 NASA celebrates the 35th anniversary of the historic launch and landing of Apollo 11 on the Moon. 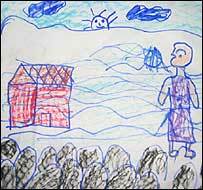 nice pictures smelly. yea assam floods is awful da. looks the situation is still above danger levels :? let us pray for everyone's well being ! Mumbai celebrates the birth of Krishna, one of the cheekier Hindu gods, with lots of pots of yoghurt....and human pyramids. Lord Krishna, an incarnation of the Hindu God Vishnu, combines light-hearted mischievousness with omnipotence. His childhood was spent flirting with milkmaids and stealing butter kept beyond his reach by his parents. On his birthday, the enthusiastic residents of Mumbai string pots of curd and butter between buildings and the brave form human pyramids to get at them, so mimicking his exploits. Dawn breaks 3 yrs on to the day, over where the Twin Towers once stood so proud. In Japan, ppl marked the day by forming a giant Peace sign in a Tokyo park. 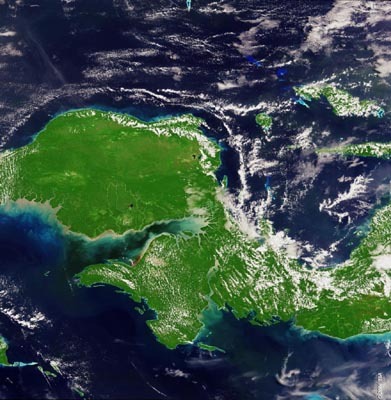 Visible from 800km away in space is the verdant rainforest that covers the distinctive Bird's Head or Doberai Peninsula of the island of New Guinea, together with the Bomberai Peninsula below it. This Envisat Medium Resolution Imaging Spectrometer (MERIS) acquisition shows the western part of New Guinea, just before Borneo as the single largest island in the tropics and the second largest island in the world after Greenland. Wow.. Amazing pic.. It does look like a bird's head..
ps: Thanks for remembering this thread. 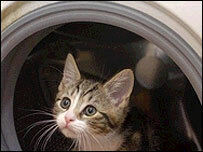 An eight-week-old kitten has survived a 10-minute spin in a washing machine. Wow all the pictures are so.. interesting. 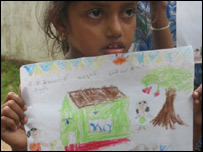 Sri Lankan Children learning to cope through art. US senator Hillary Clinton (L) meets with the Congress President Sonia Gandhi at her residence in New Delhi on February 25, 2005. Clinton is in India on a three-day visit. "The American, the Indian-Italian and the French (kiss)..."
Nasa: NASA Images Find 1,750,000 Year Old Man-Made Bridge from Rameshwaram to Sri Lanka. Who's knows their Ramayana? 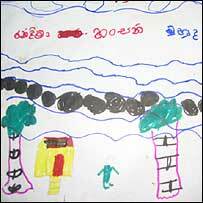 Remember the bridge built by Ram & Hanuman's Army from Rameshwaram to Sri Lanka when rescueing Seetha?